Apple’s iTunes Chief Eddy Cue has been taking full advantage of Twitter lately as his medium for sharing news. We first heard of Apple’s change of heart to pay musicians during Apple Music’s free trial via his Twitter account (in response to Taylor Swift), and now in a series of tweet replies, Cue has shared more details of the streaming music service set to go live on Tuesday, June 30 at 9AM PDT. As for song limits within Apple Music, Cue explains at launch, there will be a 25,000 song limit like iTunes Match, but Apple is “working to get 100K for iOS 9”, which would quadruple the previous limit. As for existing Beats Music subscription playlists, Cue explains an upcoming Beats iOS update will allow customers to migrate their playlists to Apple Music. 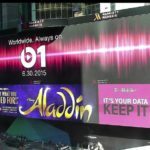 Apple continues to share tidbits of information on Apple Music leading up to its June 30 launch, as marketing efforts will surely keep ramping up until Tuesday.